I spent a bit of time this morning cleaning up my Elven Attack chariot after its Dettol bath. 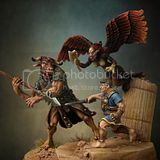 Im missing one of the characters, the Prince with spear, however I've bought off ebay the chap below who I am going to try using instead. 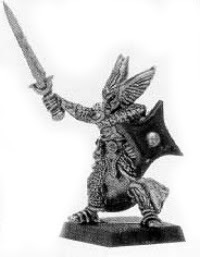 High Elf Im probably going to use instead! 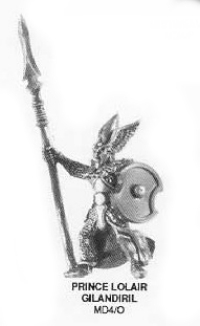 I just have to wait until he falls through the door (with 7 more elf cavalry friends! oops!) before I decide if he's suitable. What do you think? 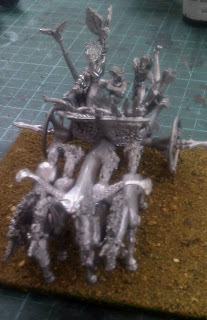 Im unlikely to find a Prince Lolair on ebay - without having to buy a whole chariot aswell! I think I may spend too much time and money on ebay as it is! Its getting to the point I feel I must part with some figures otherwise Im going to start appearing on a Channel 4 hoarder program! One day I will take a picture from inside my garage. Be warned it will be quite scary! Im also adding 'Disciples of the Red Redemption' and 'High Elf Maiden Guard' to my Stuff I wants list! I suspect that I actually have that figure. I'll route around for it tomorrow to see. If I have it, I'll send it on to you. That would be great if you did have him spare! (not sure how you would have, unless you have lost the rest of the chariot?!). Of course I would send you something in return! Happy Rooting!